EXPERIENCIAS DE KIT LAMBERT EN SU PRIMERA SEMANA EN NICARAGUA. I am now just over a week into my Nicaraguan adventure and everything is going well. I have got used to the 5 o’clock starts and I’m slowly getting used to the unrelenting heat. Everything was arranged for me by Gioconda before I arrived which made my first few days a lot easier. The accommodation in Leon is pleasant, and also has a hairdressers attached which I have already taken advantage of for the very reasonable price of about £2.50. After a day of finding my way around and getting used to my surroundings, Gioconda and I travelled to Tonala. I was introduced to numerous people including Norma, with who I shall be staying with during my time there. I expressed an interest in sport and was subsequently signed up to take a few football training sessions and also accompany the team for the Teodoro S.Kint school to Managua for a national tournament. I returned to Tonala the next day with some cones, footballs and training bibs which I had brought from England and had a session in the morning with the school team in which we did a few simple drills which seemed to go down well enough. Afterwards I took part in a game which was also enjoyable although the pitch was slightly different to those in England (not only did you have to play against the opposition, there was also the constant threat of motorcyclists, horses and old bikes in the middle of the pitch). That afternoon I went across to Barrio Plan where I met up with Francisco who is currently building the new classroom and I held a training session for his team, which also seemed to be a success. 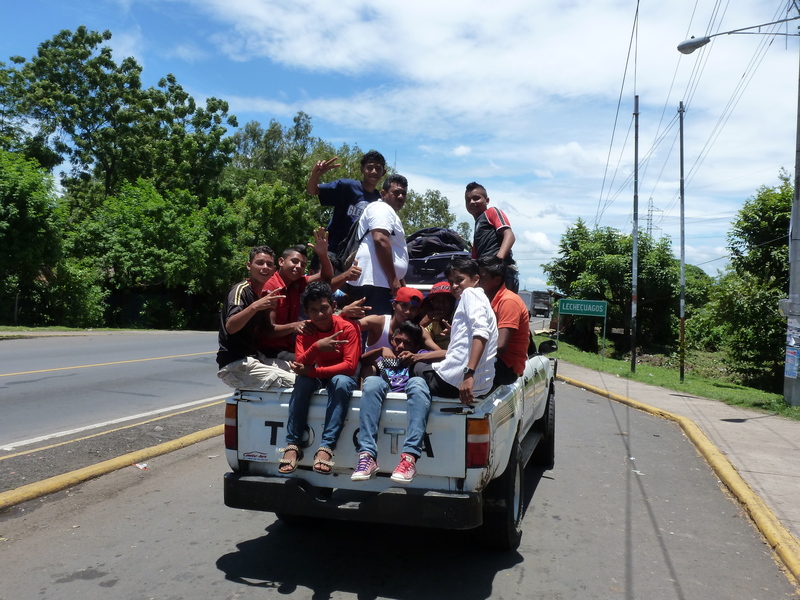 I returned to Leon to pick up a few things before hopping back on an old American school bus to Tonala on Sunday night as we had to head off early to Managua the next morning. 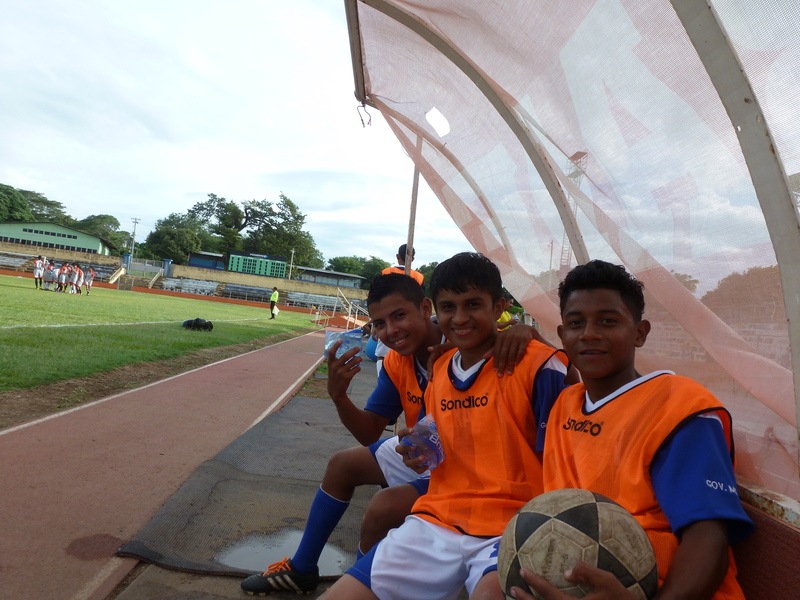 19 of us travelled to the National Sports Institute to represent the department of Chinandega in the tournament. The team was made up of 15 players from Tonala and Puerto Morazan, who were aged between 14 and 17. I was drafted in to lead training sessions and pre-match warm ups which I was happy to do. The team played three games over 2 days and unfortunately lost all three, quite heavily (6-1, 3-1, 7-1! ), but it didn’t seem to dent their morale too badly. For me, the trip was really just a good way to get to know a few more of the teachers and pupils from the school in Tonala which was nice, still annoying to not win a single game though. The next few weeks will be split between Leon and Tonala, Norma has asked to me take a few English lessons in the school and the P.E. teacher has asked me to help with a few sessions in football and basketball (that said, maybe after the team’s results in Managua he may rethink that request). 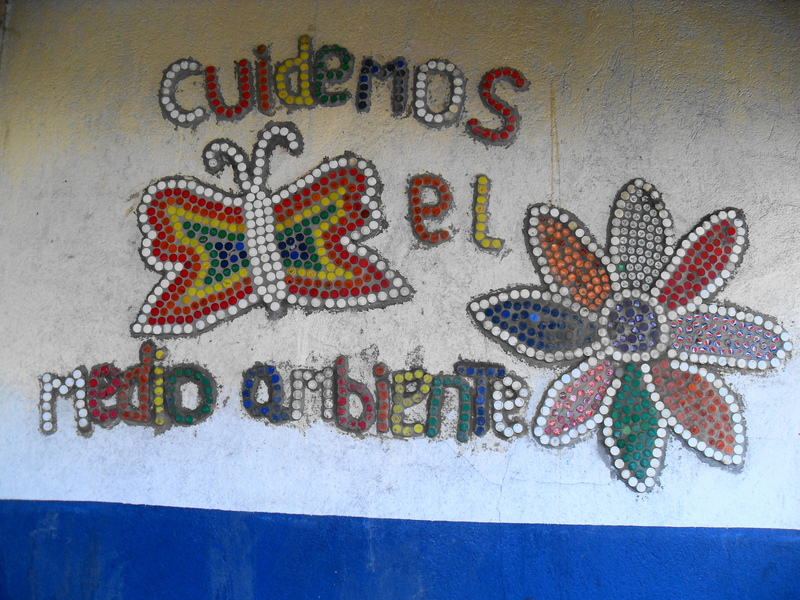 I shall also meet the Montessori teachers in the next few days after they return from Costa Rica. Hopefully things continue to go as well as they have so far, although I’m not sure how many more football sessions I’ll get asked to take. Kit Lambert. 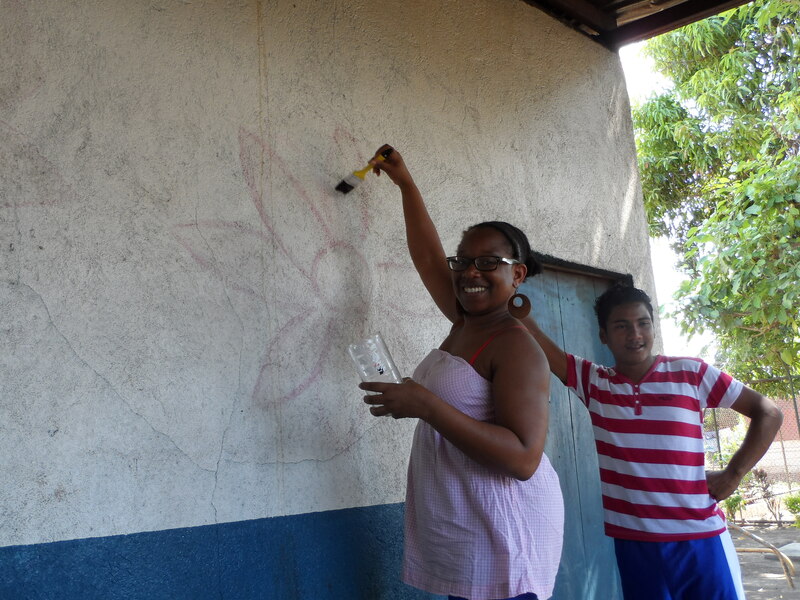 NADEGE DORIS EN TONALÁ HACIENDO MURALES CON TAPONES DE BOTELLAS. ROSA LIA, nueva voluntaria de BLINC, quien estará por 10 semanas enseñando clases de inglés en los Institutos Teodoro S. Kint y Alfonso Cortés, así como en tres preescolares montesori. BLINC volunteer projects in Puerto Morazan have ranged from teaching English in local schools, coaching sports, helping with the construction and refurbishment of schools, teacher training, running youth clubs, working with women against domestic violence and medical volunteering. BLINC is not a volunteer sending agency like VSO, and so has no specific volunteer programmes. 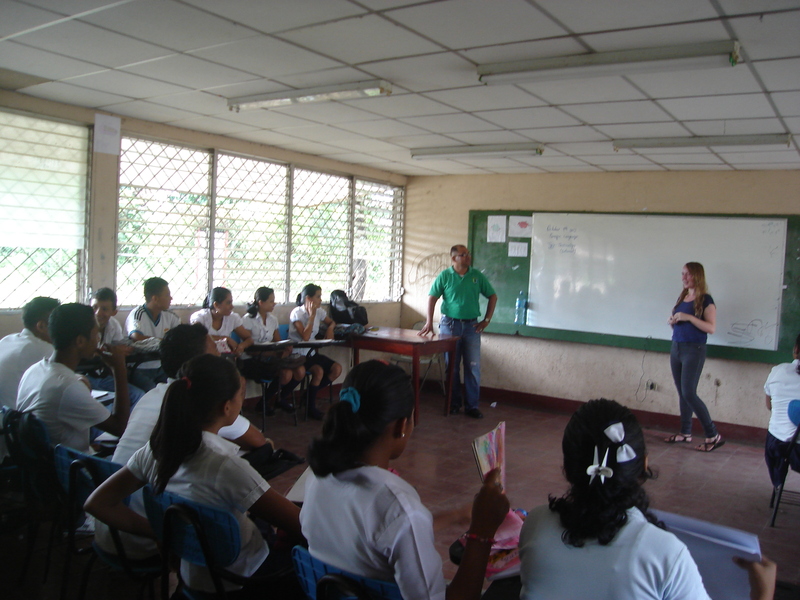 However, we welcome volunteers who can speak Spanish and have time, energy and skills to offer our Nicaraguan friends. 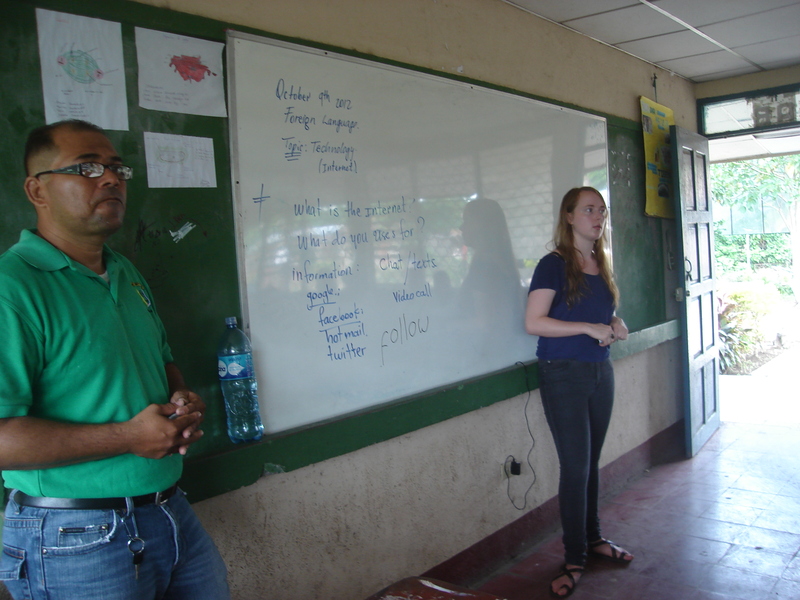 We are happy to help volunteers to arrange a placement that suits the needs and skills of individual volunteers, whilst liaising with Gioconda, our project co-ordinator in Nicaragua, to work out what might best suit the needs of our twinned communities. 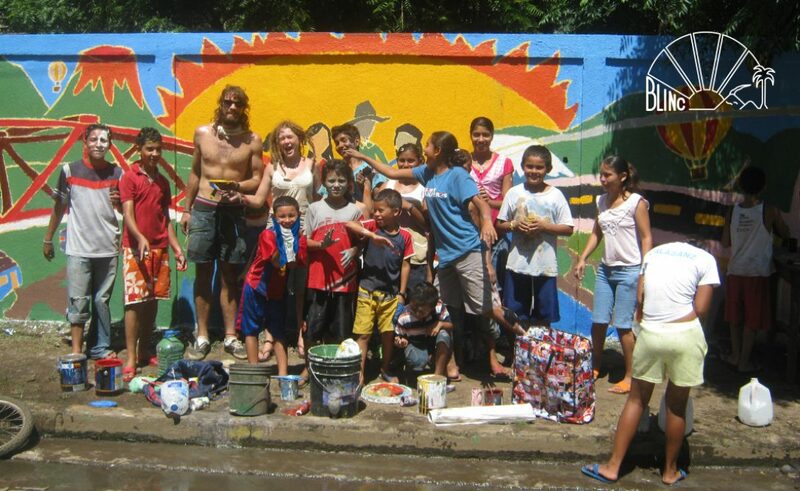 BLINC volunteers find themselves quickly accepted into the community, and often form lasting ties with Puerto Morazan. Unfortunately, BLINC does not have the funds to send individual volunteers, but we offer a secure placement with professional supervision and back-up on the ground. Check out these films about Nicaragua for school children, made by Ollie, a previous BLINC volunteer in Puerto Morazan during his stay there.